The first asylum-seekers from the migrant caravan have arrived in Tijuana after several weeks of traveling from Central America; they are part of a small group of LGBTQ migrants who split off from the larger caravan while in Mexico City. Their decision to travel separately stemmed in large part from discrimination they experienced en route to the United States, according to several asylum-seekers interviewed by the Washington Post and NPR. 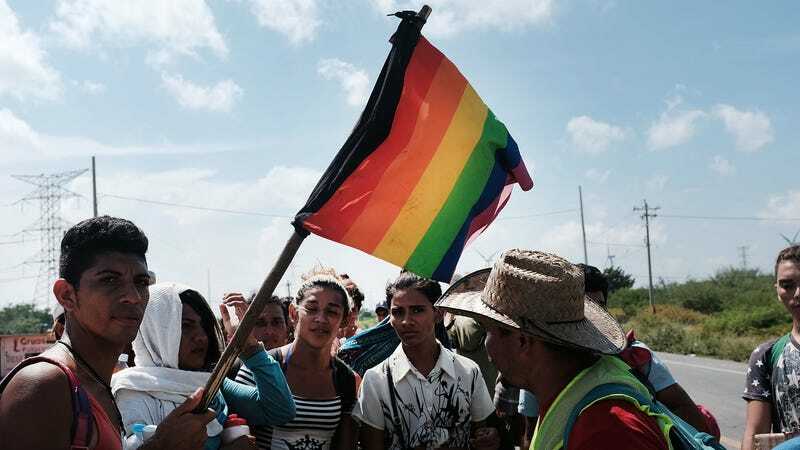 About 80 migrants, the majority of whom identify as LGBT, splintered off from the larger group in Mexico City after weeks of what they say was discriminatory treatment by local residents and other travelers, Honduran migrant Cesar Mejía told reporters at a news conference on Sunday. “Whenever we arrived at a stopping point the LGBT community was the last to be taken into account in every way. So our goal was to change that and say, ‘This time we are going to be first,’ “ Mejia said. On Sunday the group arrived at an upscale neighborhood called Coronado in Playas de Tijuana just a few miles from the San Diego port of entry. They were dropped off in the tony enclave in small groups by Mexican immigration officials who had been alerted of the migrants’ arrival in nearby Mexicali. But upon their arrival they were met with anger from local residents who said they should have been warned by local authorities that LGBT people would be renting the four-bedroom house. “This is a peaceful neighborhood and we don’t want any trouble,” Jose Roberto Martinez told Mejía. He said he lived in the neighborhood and that families in the area had survived terrible violence that plagued the region in the early 2000s — a result of the vicious drug wars in Tijuana. Another woman demanded to know how the group had come up with the money to pay the rental fee for the expensive house. Mejía assured the community they were not backed by narcotraffickers.